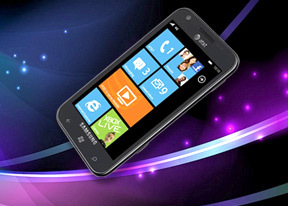 The Samsung Focus S comes with Microsoft’s latest Windows Phone 7.5 Mango update. By now, it should be a familiar sight since we’ve tested several devices which run the OS, including Samsung’s own Focus Flash. We have prepared a video of the Samsung Focus S in action. See it below. Pushing the unlock button reveals the lock screen, which displays the current time and date and shows calendar events, emails and missed calls. The background of the lock screen can be changed from either the settings menu or from the picture gallery. Swiping the lockscreen up unlocks the device and reveals the live-tile Metro user interface. It's a very fluid vertical grid of Live tiles that shows one or two tiles organized in bricked style. Each of these can be reorganized by whichever order you like and you can place almost anything in the grid by holding your finger over it and selecting the Pin to start option. The Live tiles, the basic building blocks of the Start screen of Windows Phone have been revamped. Now they are quicker and offer more info. For example, the Pictures tile shows an animated slideshow of your images. The Group tile (Groups is a new feature to boot) lists friend updates. The application list has grown a virtual Search button, which makes finding apps easier for those with many apps installed. One of the main novelties brought by the latest WP build - 7.5 Mango - is multitasking. It still isn't true multitasking; things are being done the iOS way. Apps not in the foreground are suspended, but the OS has ways to take over and carry out the task for them. We only worry that this logic can be too restrictive for some apps, but we'll see how things pan out. Of course, there will be a transitional period when some apps will support multitasking and others won't. We've been there with the iOS, when it first left the realm of single-tasking – it’s not that bad. Anyway, to switch between apps you press and hold the Back key (that's right, the Back key, not the Windows key). The app switcher itself looks similar to that of Symbian or WebOS: thumbnail snapshots of the apps, ordered chronologically left to right. Eventually, as you open more apps, the old ones start to drop out of the list. Once an app is gone, you have to launch it again the old fashioned way, which has the drawback of starting it over from the beginning. Finally apps with active background tasks (e.g. streaming online radio) will keep on working.